Overall the MotoChic Valerie is a versatile little bag that works as well off the bike as it does on. Recently I received a sweet little bag from MotoChic Gear to review, and a breath of hope for women’s motorcycling accessories arrived with it. The Valerie bag ($55) is billed as a versatile, oversized wallet that transitions seamlessly from riding to everyday use. Wow, does it ever deliver on that promise. This deceptively slim bag, crafted in a durable nylon, arrived packaged with a leather wrist strap and an adjustable nylon waist strap. Both are removable and re-positionable to convert the Valerie into myriad wearing possibilities: cross-body bag, shoulder bag, wristlet, clutch and waist pack. The Valerie’s perfect clutch size and rounded corners invited me to pick it up, while the contrasting bright red zipper and hefty leather tassel make it a bold fashion choice. Zipping it open I discovered a charming motorcycle-printed interior fabric (also in a very sturdy nylon), along with thoughtfully sewn, plentiful credit card pockets and a tiny, zippered pouch for change. As of writing this, I have carried the Valerie daily for about a month, and I haven’t observed so much as a loose thread, making it as durable as it is attractive. I love the understated, stamped silver logo on leather, complemented by matching silver hardware throughout. The classic red, black and grey color scheme is perfectly suited to anyone who gets queasy at the sight of pink (guilty), and thus earns my undying appreciation. The most ingenious part of the design, however, is the accordion-style bottom. This panel allows the bag to expand and accommodate a phone, lipstick, key and even a multitool. I tried over-packing this tiny, unassuming bag with bottles of nail polish, and found that it holds eight! I openly defy any other women’s wallet to make such a claim. Go on. I’ll wait. The MotoChic Valerie is a sister product to the larger, Lauren bag, which is explored in detail on the MotoChic website. I’ve definitely got my eye on the Lauren for my next gear review. The quality of these accessories are, I believe, the direct result of personal involvement from the San Francisco company’s founder, Debra Chin, who is a rider herself. She’s refused to compromise style or function in creating these accessories that I think any female rider could incorporate into her riding ensemble or casual wardrobe. 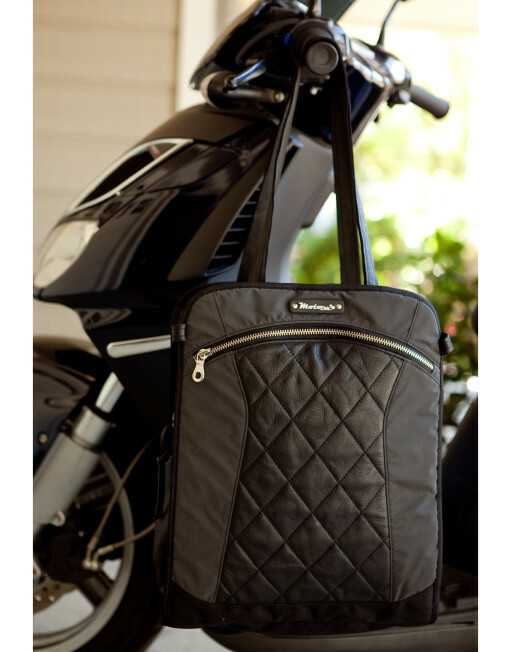 In 2014, MotoChic successfully completed a Kickstarter campaign to raise funds for the Lauren bag, so it’s obvious that female riders are perking up at the quality and style being offered. The way I see it, MotoChic is granting dignity to a segment of the population still being heavily courted by rhinestone patches and fringed halter tops, and that’s when we’re courted at all. Respect for female riders is an idea whose time has come, especially as women now comprise more than 25% of total two-wheel riders. For me, MotoChic is truly the brand to own if you want to reconcile a love of designer accessories with the practical concerns of riding. A report from PR Newswire is predicting major growth between 2015 and 2025 for three main segments: electric motorcycles, electric maxi-scooters, and 3-wheelers.